The important thing to remember is that you are merely trying to press away the wrinkles from the jacket. If an area has no wrinkles, do not press. 1. The iron should have a Teflon coated shoe. If the shoe is bare aluminium, it is necessary to use a pressing cloth. You can use a linen pocket square or a handkerchief as a pressing cloth. If you press with a bare shoe, you risk putting an "iron shine" to the cloth. 2. This is pressing, not ironing. 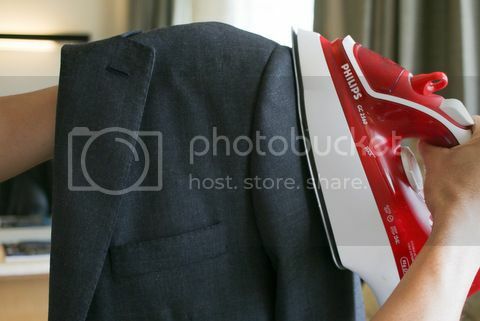 You do not rub the iron all over the cloth. 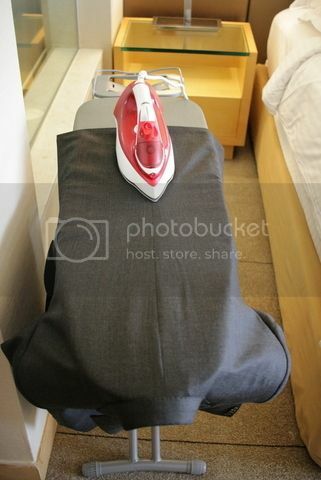 You place iron on cloth, wait, then raise it and place it on another spot. 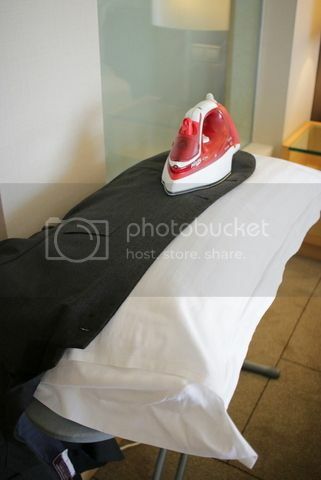 When there is contact with cloth, the iron is immobile. If you rub, there will be iron shine. 3. 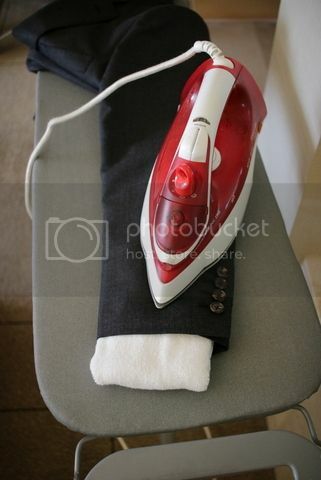 Use a low wool setting on the iron. A high setting will singe the wool fibers and destroy the cloth. Irreversibly. 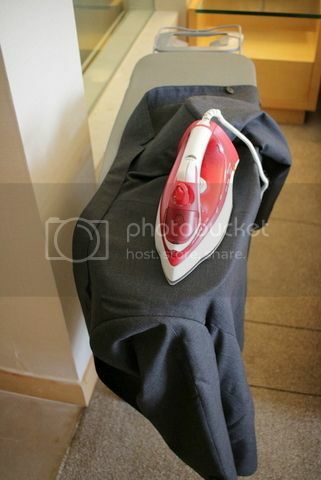 It is better to err on the side of an overly cool iron than an overly hot one. 4. Use a dry iron, i.e. no steam. Remove any water from the iron's water well, and make sure it is ejecting no steam when operational. Steam will program the cloth. You want merely to return it to its original programming. 5. You do not need to exert pressure on the cloth. Do not shift your body weight onto the iron. Mere contact between iron and cloth will do. 6. Wait 6 seconds before lifting the iron to another spot. You press the back this way. The upper back and armscye region can be pressed this way. The front can be pressed this way. If possible, avoid the chest and shoulder areas. Some of you may go, OMG kotmj, my suit cost me a year's bonus and I had to travel to Italy to have it made. Two trips. Pressing the front on a flat surface like that is too ghetto even for my standards! *teeth gnashing* Fine, press it on a pillow. Don't place it over the whole pillow, but over only half the pillow with the rest of the jacket hanging off it for maximum shape. Still avoid chest if you can. Now we arrive at the sleeves. Tailors use a sleeve board to press sleeves. 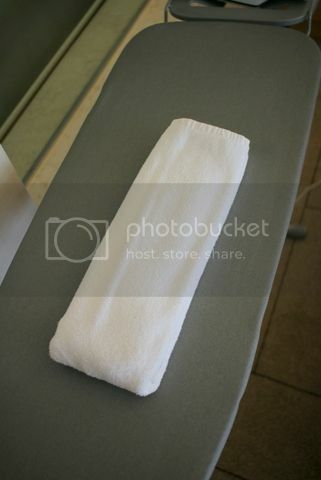 In a hotel setting, use a rolled up towel to approximate a sleeve board. Insert towel roll into sleeve and press. The upper sleeves -- the part that is round and attaches to the bodice of the jacket -- is a little complicated. Tailors use a little pillow like this to press the upper sleeve. You don't have one, so move the towel roll all the way up till it can't go up anymore, and while supporting the jacket this way, press it. If you press only where there are wrinkles, you will be done in under 10 minutes. Very good tips. 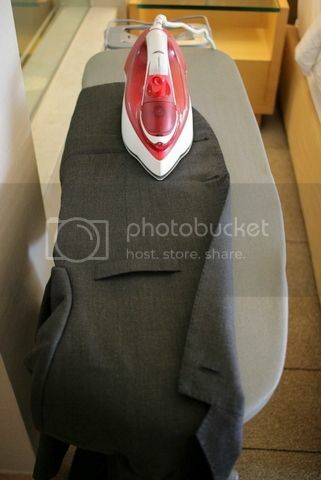 I used to think that the only way to get my suit straightened is to send it to the dry cleaners. Thanks. Need this info in a pinch (but shall avoid pressing at all costs, if possible). How did u take the last pic?